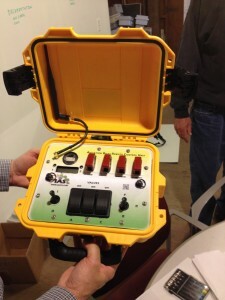 ￼￼￼￼￼ The IAS Lagoon Boat Remote Control (LBRC) is our unique two component wireless control system with over a 1500’ range. Our LBRC system will allow you to safely position your lagoon boat preventing damage to the bank and liner, adjust the agitation intensity, pump the nutrient to the booster pump and easily locate the boat for removal. Our Lagoon Boat Remote Control (LBRC) simplifies the operation of your Lagoon Boat. It helps prevent accidents affecting surrounding water quality and subsequent time consuming clean up. It will help you improve the efficiency of your application crew and gives you the ability to fully utilize the advantages of the Lagoon Boat. 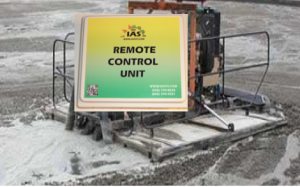 Retro-Fit and existing Lagoon Boat with our IAS LBRC to improve its remote operation by simplifying its use through our intuitive user interface. It allows your operator to Safely operate the Lagoon Boat from up to 1500’(line of sight) away, from the security of his truck or ATV. Simple user interface, requires no formal training and has no multi-use function keys to memorize. Our Lagoon Boat Remote Control helps your operator to Safely operate the Lagoon Boat from up to 1500’ (line of sight) away, from the security of his truck or ATV. Simple user interface, requires no formal training and has no multi-use function keys to memorize. The IAS Lagoon Boat Remote Control (LBRC) is our unique two component wireless control system with over a 1500’ range. Use our IAS LBRC to maximize the treatment and storage volumes in the lagoon. Save fuel and labor while improving safety around the lagoon storage area. Integrate it with our IAS AutoBoost™ application system coupled with our IAS Maximizer™ Software to maximize your application rate (+ 20 to 60%) while helping to insure water quality.